SFML provides simple classes for the most common 2D entities. And while more complex entities can easily be created from these building blocks, it isn't always the most efficient solution. For example, you'll reach the limits of your graphics card very quickly if you draw a large number of sprites. The reason is that performance depends in large part on the number of calls to the draw function. Indeed, each call involves setting a set of OpenGL states, resetting matrices, changing textures, etc. All of this is required even when simply drawing two triangles (a sprite). This is far from optimal for your graphics card: Today's GPUs are designed to process large batches of triangles, typically several thousand to millions. To fill this gap, SFML provides a lower-level mechanism to draw things: Vertex arrays. As a matter of fact, vertex arrays are used internally by all other SFML classes. 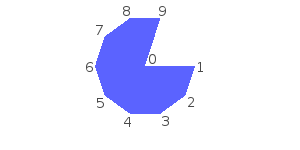 They allow for a more flexible definition of 2D entities, containing as many triangles as you need. They even allow drawing points or lines. What is a vertex, and why are they always in arrays? A vertex is the smallest graphical entity that you can manipulate. In short, it is a graphical point: Naturally, it has a 2D position (x, y), but also a color, and a pair of texture coordinates. We'll go into the roles of these attributes later. Vertices (plural of vertex) alone don't do much. 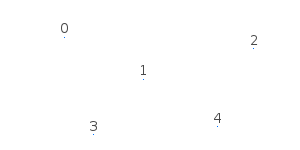 They are always grouped into primitives: Points (1 vertex), lines (2 vertices), triangles (3 vertices) or quads (4 vertices). You can then combine multiple primitives together to create the final geometry of the entity. Now you understand why we always talk about vertex arrays, and not vertices alone. Let's have a look at the sf::Vertex class now. It's simply a container which contains three public members and no functions besides its constructors. These constructors allow you to construct vertices from the set of attributes you care about -- you don't always need to color or texture your entity. Now, let's define a primitive. Remember, a primitive consists of several vertices, therefore we need a vertex array. SFML provides a simple wrapper for this: sf::VertexArray. It provides the semantics of an array (similar to std::vector), and also stores the type of primitive its vertices define. You can see that the vertices' color is interpolated to fill the primitive. 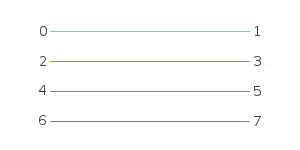 This is a nice way of creating gradients. Note that you don't have to use the sf::VertexArray class. It's just defined for convenience, it's nothing more than a std::vector<sf::Vertex> along with a sf::PrimitiveType. If you need more flexibility, or a static array, you can use your own storage. You must then use the overload of the draw function which takes a pointer to the vertices, the vertex count and the primitive type. Let's pause for a while and see what kind of primitives you can create. 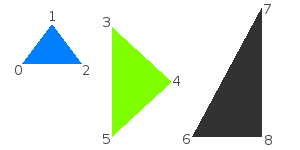 As explained above, you can define the most basic 2D primitives: Point, line, triangle and quad (quad exists merely as a convenience, internally the graphics card breaks it into two triangles). There are also "chained" variants of these primitive types which allow for sharing of vertices among two consecutive primitives. This can be useful because consecutive primitives are often connected in some way. sf::Points A set of unconnected points. These points have no thickness: They will always occupy a single pixel, regardless of the current transform and view. sf::Lines A set of unconnected lines. 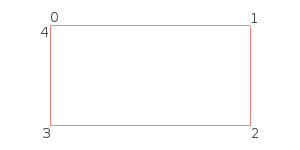 These lines have no thickness: They will always be one pixel wide, regardless of the current transform and view. sf::LineStrip A set of connected lines. 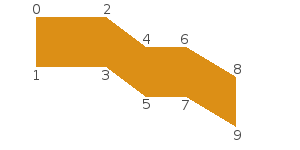 The end vertex of one line is used as the start vertex of the next one. sf::Triangles A set of unconnected triangles. sf::TriangleStrip A set of connected triangles. Each triangle shares its two last vertices with the next one. sf::TriangleFan A set of triangles connected to a central point. The first vertex is the center, then each new vertex defines a new triangle, using the center and the previous vertex. sf::Quads A set of unconnected quads. The 4 points of each quad must be defined consistently, either in clockwise or counter-clockwise order. 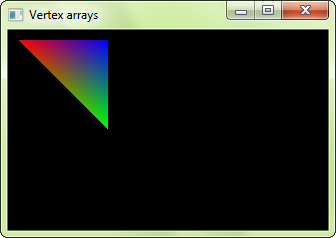 Like other SFML entities, vertex arrays can also be textured. To do so, you'll need to manipulate the texCoords attribute of the vertices. This attribute defines which pixel of the texture is mapped to the vertex. Texture coordinates are defined in pixels (just like the textureRect of sprites and shapes). 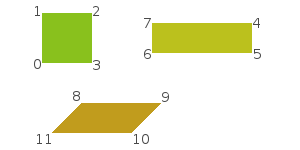 They are not normalized (between 0 and 1), as people who are used to OpenGL programming might expect. Transforming is similar to texturing. The transform is not stored in the vertex array, you must pass it to the draw function. To know more about transformations and the sf::Transform class, you can read the tutorial on transforming entities. Now that you know how to define your own textured/colored/transformed entity, wouldn't it be nice to wrap it in an SFML-style class? Fortunately, SFML makes this easy for you by providing the sf::Drawable and sf::Transformable base classes. These two classes are the base of the built-in SFML entities sf::Sprite, sf::Text and sf::Shape. Note that doing this is not mandatory, you could also just have a similar draw function in your class and simply call it with entity.draw(window). But the other way, with sf::Drawable as a base class, is nicer and more consistent. This also means that if you plan on storing an array of drawable objects, you can do it without any additional effort since all drawable objects (SFML's and yours) derive from the same class. The other base class, sf::Transformable, has no virtual function. Inheriting from it automatically adds the same transformation functions to your class as other SFML classes (setPosition, setRotation, move, scale, ...). You can learn more about this class in the tutorial on transforming entities. With what we've seen above, let's create a class that encapsulates a tile map. The whole map will be contained in a single vertex array, therefore it will be super fast to draw. Note that we can apply this strategy only if the whole tile set can fit into a single texture. Otherwise, we would have to use at least one vertex array per texture. 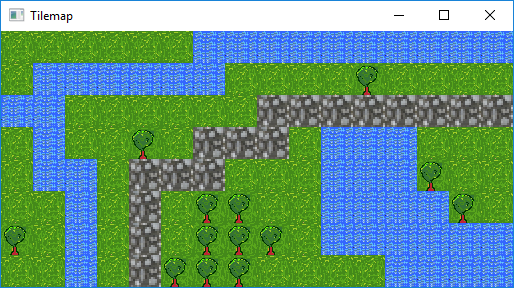 You can download the tileset used for this tilemap example here. This second example implements another common entity: The particle system. This one is very simple, with no texture and as few parameters as possible. 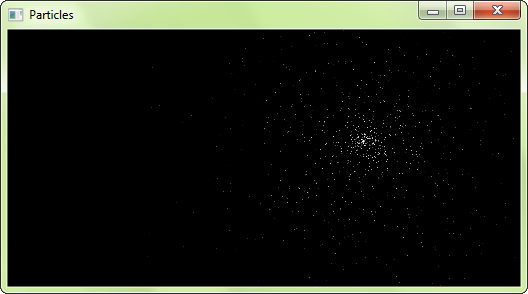 It demonstrates the use of the sf::Points primitive type with a dynamic vertex array which changes every frame.